Who did you find under the mistletoe this festive period? A Countess For Christmas by Christy McKellen The Earl's secret bride... Emma Carmichael is shocked when she sees who she's waitressing for at a lavish party-Jack Westwood, the new Earl of Redminster. Her new life comes crashing down when Jack announces to the world that they're married! Jack has never forgotten his first love, despite the tragedy that tore them apart. When the paparazzi cameras intrude he proposes they live as man and wife until the fuss dies down. Emma feels like Cinderella, masquerading as his Countess...only behind closed doors their marriage feels tantalisingly real... Greek Tycoon's Mistletoe Proposal by Kandy Shepherd A proposal of convenience! When guarded billionaire Lukas Christophedes finds maid Ashleigh Murphy living in his mansion, he strikes a deal with his gorgeous gate-crasher. If Ashleigh acts as Lukas's girlfriend to help him close a crucial business deal, she can stay until the New Year. For newly single Ashleigh, agreeing to keep hearts off the table sounds easy...until the line between what's real and what's for show starts to blur! 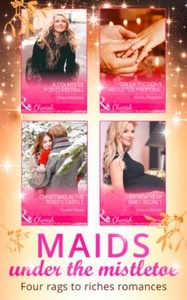 And as Christmas approaches all Ashleigh is wishing for from Lukas is a different, much more heartfelt romantic, proposal... Christmas In The Boss's Castle by Scarlet Wilson The maid who saved Christmas Chambermaid Grace Ellis loves Christmas, but after losing her beloved grandmother, she'll be spending this festive season working. So when her boss, Finlay 'Scrooge' Armstrong offers her a magical Christmas in Scotland, it's a welcome distraction from her grief. Widower Finlay is haunted by the ghosts of Christmas past, but snowbound together in his Scottish castle, Grace starts to melt the ice around his heart. He never thought he'd find love again, but maybe finding Grace is his very own Christmas miracle...! Her New Year Baby Secret by Jessica Gilmore The Italian millionaire's secret heir! Waitress Sophie Bradshaw is normally ignored at glamorous parties, but Marco Santoro offers her his jacket in the snow...leading to a magical Christmas evening together. And when one night isn't enough, the millionaire invites Sophie to his Venetian palazzo-not knowing Sophie is bringing a tiny surprise with her!